In Dublin, the rain never ends. If that dour sentence reads like it might have been taken straight from the fatalistic Dubliners, it may be no coincidence: where James Joyce famously contended, in “A Little Cloud,” that, “You could do nothing in Dublin,” Danny Denton, in his debut novel, The Earlie King & the Kid in Yellow, refracts a good deal of his country’s literary heritage to depict what might happen after centuries of all that doing nothing—that is, collapse. Set centuries into the future, The Earlie King & the Kid in Yellow takes place in an Ireland submerged under a perpetual rainfall. It hasn’t stopped raining in hundreds of years, and distant folk-memories of the Celtic Tiger are whispered in an endlessly corrupting process of myth-making. Whole histories, complete chunks of time which historians refer to as “periods,” have filled the time between the dotcom boom and the era of this novel—“once automation became the industry standard our last hope of a stable economy was gone … the people moaned of corrupt governments, the badness in religion … hippies began to speak of an old god named Manannán Mac Lir coming back” (p. 60). In this way, our own digital age feels simultaneously hopelessly distant from and thoroughly woven into the culture of this future Ireland, just as dim, inaccurate reminiscences of the Dark Ages permeate our contemporary culture. Denton’s characters gaze on the remains of twenty-first-century civilisation, architectural and otherwise, wryly: “The idea was that the Flats would return us again to the sense that we were all connected. Of course that sea view, like the utopian stuff, was lost in smog and drizzle and cloud” (p. 67). This, then, is a grim and pessimistic book. The society that has risen up under the endless rain cloud is, as you’d imagine, sodden and desultory. A sense of weariness suffuses these pages, as depressed policemen tinker around the edges of an economy almost entirely directed by criminal bosses (of whom the Earlie King of the title is the capo di tutti capi). A personification of meaningless slaughter, Mr Violence, stalks the dreams of even apparently rational characters, and seems to make his way out of those and into the streets of Dublin. Random but spectacular terrorist attacks, presumed to be undertaken by a possibly ageless force of anarchy known as St Vincent Depaul, are in a shocking way the only sign of hope: as with V in Alan Moore’s V for Vendetta, the nihilist becomes the hero purely by dint of the bankruptcy of the values he attacks. All of this—and the world of this novel feels exceedingly rich, as Denton parcels out stories of all kinds, from gossip to myth to history to propaganda—is conveyed in a particularly impressive opening quarter via a range of literary forms. Many pages are lashed with streaks of pencil-like lines—the ever-present stinging rain making its way into our own experience of the words on the page—and these pepper a mess of material, from purported transcripts of recordings made for posterity by an obscure narrator, through extracts of a script supposedly belonging to a play satirising the King and his Earlie Boys. We are introduced to policemen and pushers, folksingers and bereaved mothers. This future society teems even as it teeters; Denton gives his characters a grim existence, but they seem to make something of it anyway. 2018 may perhaps be remembered as the year in which the fact of climate change began to make itself physically known in the world, even to those who might previously have been able to ignore it. A much-shared graphic comparing the hotspots of 2018 with a previous year known for its heatwaves, 1976, made clear that the entire globe was undergoing not so much a set of unusual weather patterns as something approaching a new single, shared experience. Denton’s is a novel that imagines what it might be like to live in a future ravaged and defined by a permanently inhospitable climate. “It was impossible to tell whether the rain was one thing, a single natural element, or a trillion things happening at once,” one character observes, and in doing so encapsulates the totality of the societal change wreaked by initially small alterations to the wider environment. Ireland is ruined: its once lush farmland marsh, its once marshy peat bogs submerged; its cities mere townships, its people shuffling from one hovel to the next, weighed down constantly by waterproofs. In this grey scene stands out a young boy, perhaps thirteen, who wears the sort of jolly macintosh that might in a drowned future seem obscenely jaunty: the kid in yellow. On the lowest rungs of the Earlie Boy hierarchy—the dangerous ascent of which accounts for all those bereaved mothers—the Kid, whose name isn’t revealed until late in the novel, finds himself in a brief relationship with T, the daughter of the King. When she dies in childbirth, the Kid and the King are trapped by their respective final promises to her: the Kid pledged that he would take T’s child away from her brutal, unforgiving father; the King promised that he would not kill his daughter’s lover … as long as he never saw the Kid again. Of course, Kid meets King at the site of the kidnapping—and the novel swiftly switches to a prolonged chase narrative, in which the Kid traverses rural Ireland with babe in tow, hounded by his hunters and harried by a range of eccentric, but increasingly inspired, peasants and hobos. This, of course, is the stuff of fairytale. On the novel’s opening page, too, we are presented with words selected and arranged in the style of the circus. The pumped-up prose piques our interest, promises us entertainment: “Here, today, in the world’s last true HEDGE SCHOOL, you’ll hear a tale from the deep, told to you by the last 100% authentic TRUE IRISHMAN!” From the off, then, the novel isn’t quite a standard piece of science fiction. It’s more a futuristic kind of myth, a speculative fabulation, a knowing entry in the long-running story Irish literature has told about itself. During the period of English rule in Ireland, hedge schools were those places where, supposedly hidden beneath or within rural foliage (but more commonly in out-of-the-way barns and houses), banned Catholic priests could teach illicit students the illegal language of Gaelic and its culture’s prohibited mores. The Earlie King & the Kid in Yellow poses as an artefact with a similar purpose: within it is enclosed in some way an Irishness, preserved for a new period of adversity and privation. From some perspectives, however, science fiction is not a genre terribly well suited to this sort of application. Certainly, Irish literature is not overly troubled by a sizeable corpus of SFnal work particular to its mores. By some metrics the first work of modern SF, Gulliver’s Travels, was written by an Anglo-Irish priest, to be sure; and that was followed in way of response by the rather less well-remembered Memoirs of the Twentieth Century (1737), by the Irishman Samuel Madden—but this latter text was banned by Robert Walpole, and its influence on what came next was therefore limited. The weird fiction of the aristocratic Edward Plunkett, eighteenth Baron of Dunsany, stands out, perhaps, but likewise can barely be considered part of any particular tradition. More modern Irish SF can be just as hard to find: in a properly SFnal career, James White’s most famous novel might be The Watch Below (1966), a book also interested in humans overcome by water; and Eoin Colfer, of course, is famous for his Young Adult work; but the SFnal work of many Irish writers, such as Caitlín R Kiernan and Anne McCaffrey, is in one way or another embedded more in other traditions, in their cases the American (though Kiernan’s love of wordplay and mood shares much of course with Joyce and, also and by extension, Denton). Perhaps this is why The Earlie King & the Kid in Yellow reads so freshly even to a habitué of science fiction—because it shares a great deal more with the postmodernism of contemporary Irish writers such as Kevin Barry, whose marvellous Beatlebone (2015) won the Goldsmiths Prize for experimental fiction, and Mike McCormack’s more science fictional Notes from a Coma (2005). By this reading, science fiction offers Denton a lens through which to refract perennial Irish concerns more than it offers a “universal” mode. “I had this feeling of time flipping,” one of his characters muses in the novel’s final third, “… of past, present and future spread out in front of me on a flat surface” (p. 208). The Earlie King & the Kid in Yellow works in a similar way, and uses SF to facilitate this rolling out. It evokes James Joyce far more than Isaac Asimov, is embedded in the metafictional tradition of Flann O’Brien to a far greater extent than the cyberpunk stylings of William Gibson. At one point, a policeman—astonished by the lack of fear or defeat in the Kid’s demeanour—gasps: “It was if he had stumbled upon the existence of a whole shape or species, something that filled the world with wonder again” (p. 37). With a vaulting ambition, it feels like Denton is aiming for something similar. He doesn’t quite succeed. When the novel proceeds towards its chase sections, the narrative slackens a little—again like Joyce, Denton finds he has less to write about when his pen leaves the confines of Dublin. The fairytale setup never quite delivers; the new myth, perhaps over-striated by all that pesky science fiction, doesn’t quite live up to the pre-existing ones embedded within it. The world-building vitality of those opening pages—all those fukkits and grotesques—is never rekindled once the Kid steals his baby. This is a shame, given the story only really starts at that moment. Here is a novel, it sometimes feels, that boasts a setting in search of a plot. But what a setting! And what ambition. Denton doesn’t write for the sake of it—he is seeking to achieve something, and to achieve something different. There’s a vigour in that which does the inheritance under which Denton sometimes labours, and sometimes shines, proud. 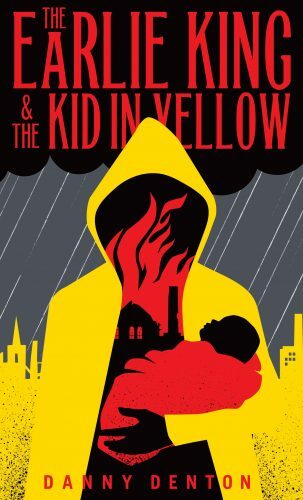 The Earlie King & the Kid in Yellow might not quite be science fiction, or quite myth; it might not quite be modernist or postmodernist, “Irish” or “universal;” but it is bracingly fresh. In the elegiac final pages of the novel, the narrator sighs that, “These memories don’t fade: they grow, grow, grow” (p. 333). Denton’s is a work in intense, creative dialogue with traditions older, weirder, and wider than science fiction alone. But in this novel, each tradition benefits from the company of the other.